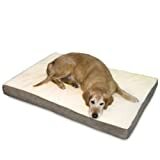 A combination of comfort and durability makes this bed perfect for any pet owners trying to give their pet the ultimate place to call their own. The sturdy polyester and cotton fabric along with the spun polyester and cedar filling make this bed one of the best on the market. 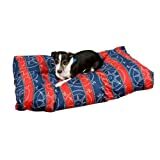 With a wide variety of fabric options you are sure to find the right bed for you and your pet.